Over the past few months, I’ve been working with a core team to help revamp the Student Innovation Fellowship’s website. My main duty has been to create and maintain SIF’s visual presence through video. It’s been a delight and a challenge to work on this, mostly because of the amount of freedom I’ve been allowed. I have the resources and time to build an image for the program, but that image has to be polished in a way that reflects the cutting-edge results that people have come to expect from the program.. This challenge is made more complicated by the environment in which this image resides: the internet. I feel like the internet, or more specifically the Web, has completely changed our media paradigm within the past ten years. The very framework of HTTP and the World Wide Web is based on interconnectivity and linking. This means that anything accessed through the Web is necessarily porous, able to affect and be affected by anything else on the Web. I feel like these bridges between sites translate to bridges between types of media, where video, text, images, and sound can all be part of one discrete post. 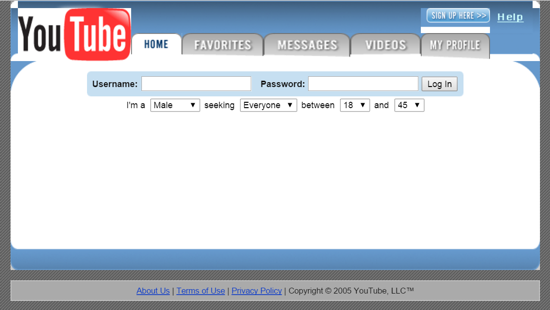 While it may not reflect the general visual style of its contemporaries, this antiquated homepage can give us an impression of the progress YouTube has made since its birth. The already fast-paced world of mass media has only grown faster thanks to the Web. In less than ten years, YouTube dropped most of its social media aspects, became acquired by Google, revamped its layout and video player at least ten times, and became the world’s largest video sharing site. So in this online Wild West, left unregulated by government but controlled by tech “cattle barons” like Google, how does one keep up with the ever-changing trends that shape the digital landscape? In my personal opinion, one shouldn’t make the attempt. I’ll qualify that statement: One shouldn’t try to keep up with every change in UI and visual style that the big competitors push out. A website like YouTube or Facebook hires hundreds of designers, artists, and marketers to continually refresh itself and make itself more accessible to the general public. Those without such teams are better off focusing on the simplest way to access what they want to exhibit, instead of worrying about animated menu bars or applets. That’s why we’re focusing on the projects for this site. Our new design is built around project pages and collaborator pages, each linked to one another for easy navigation. We’re making an end product that exhibits our students’ great projects without unnecessary clutter, and provides all the information that collaborators need to see our caliber of work.